Hi everyone, here is card number 1 in my christmas card series and as you can see, I used the cute little penguins to make my snowy scene. Firstly I used a piece of water coloured card stock and used my salty ocean Tim Holtz distress ink to ink blend on to the card. I then spritzed the ink with my mini spritzer, I then dried it off using my heat gun, I repeated the process and was happy with it. I stamped the penguin images using memento black ink and coloured them using Spectrum Noir & Pro markers to colour the images, I then fussy cut around the images leaving a small white border. I had cut two snow banks from my border dies, I used foam tape to attach the first one on to the bottom of my card, I had stamped and cut out three christmas tree images, I used Tim Holtz peeled paint distress ink. I used the 2nd hill and stuck it on to my card and placed the other 2 christmas trees on. 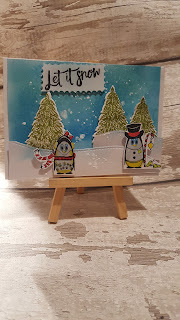 I then used a small amount of white acrylic paint on my craft mat and sprayed it with water, I then used my fan brush to add white splatters all over the card, This was done to have the paint look like snow. I stamped my sentiment on to white cardstock using versafine onyx black ink and cut around it with my fancy edge scissors, I stuck the sentiment in the top left hand corner of my card using foam pads. All that was left was to stick my cutie penguin images on to my card, again i used foam pads. Finally I used my Crafters Companion sparkle pen to go over my sentiment and my penguins, this left a lovely sparkle effect on my images.